. Teikin Oorai, Teikin ōrai 庭訓往来 textbooks in Edo .
. gakumonjo 学問所 Academies of Higher Learning - Introduction .
. CONFUCIANISM IN THE EDO (TOKUGAWA) PERIOD . ... In sum scholarly Neo-Confucian studies were widespread and varied. A number of Confucian "academies" (like think tanks) were established, such as the Kaitokudo in Osaka. A so-called "merchant academy," it taught, subtly, that the merchants did have value to society as well and their contribution to the welfare of the realm was significant. Generally, only the samurai class would attend these academies, so this gave merchants a place to send their sons and instill pride in what their families did. On the popular level, though, people learned about their place in society and the importance of loyalty and filial piety through travelling scholars and what was taught in the terakoya or temple schools. 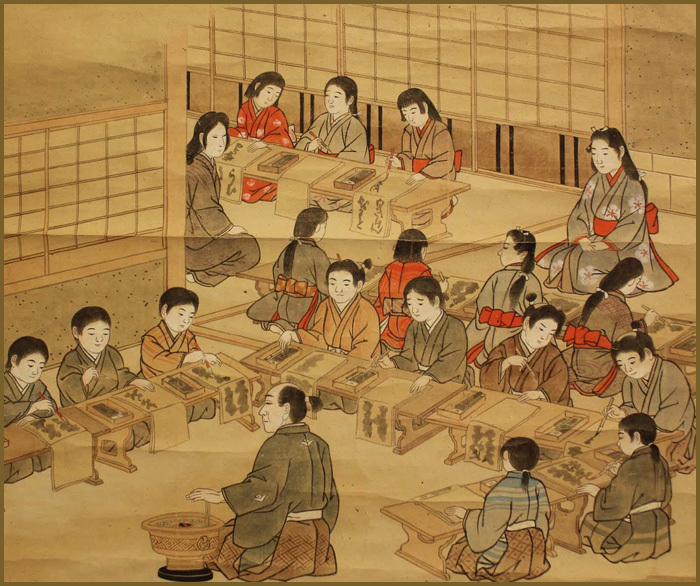 Terakoya (temple schools) were public educational institutions that provided children with an education of reading and writing and in some places taught the use of the abacus. 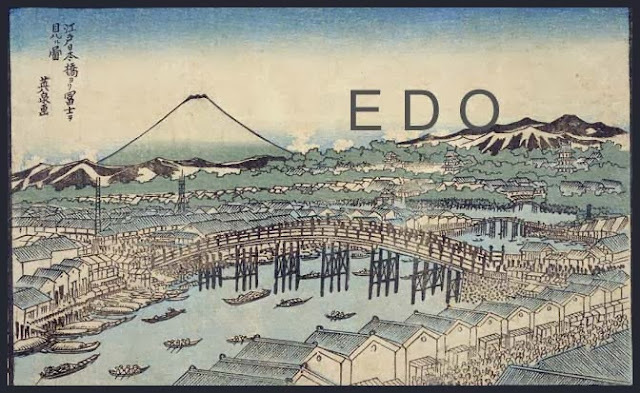 They existed not only in Edo but in also in other towns and villages throughout Japan. Thousands of terakoya began receiving pupils throughout the country during the Tempō era (1830-1844). The number of terakoya at the end of the Tokugawa Shogunate seems to have reached some thirty or forty thousand and it was these institutions that contributed to the high levels of literacy among ordinary people. An example from the beginning of the Meiji period, according to a survey conducted by the Tokyo government, the majority of terayako teachers were Edo citizens. Many were men, but in urban areas, especially in Edo, there were also female teachers. The teachers would consider the professions of the parents of the children who came to learn at terakoya and also their desires and would carry out education respectively with individual curriculums tailored to these needs and circumstances. From the term "rikugei", which means the six kinds of knowledge a wise man has, "osanarikugei" denotes the six subjects necessary for children to learn. "Sho" means calligraphy and "sū" means the Japanese abacus. 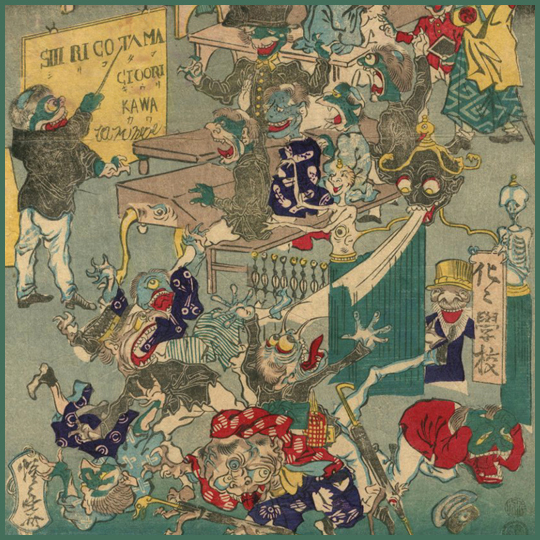 Children learning "sho" and "sū" are depicted. Rikugei was knowledge required in ancient China for people who held a rank higher than samurai. It means six kinds of knowledge including "Rei" (moral education), "Raku" (music), "Sha" (archery), "Gyo" (technique to operate horse cart), "Sho" (literature) and "Sū" (math). 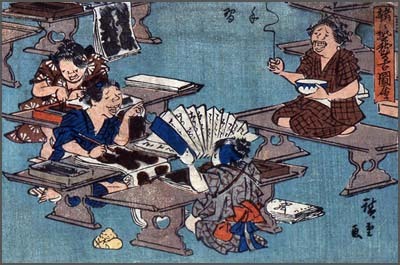 These works are a two piece nishiki-e (colored woodblock print) series depicting a class at terakoya (temple school). A male teacher teaches the class at "Shinomaki" (first volume) and a female teacher at "Suenomaki" (end volume). You can see that most of the children behave freely. At terakoya (temple school) in the Edo period, not all students sat facing the teacher, the textbooks used and the ages of children varied and attending the class or not was optional. Most children in the picture are not studying quietly. There are indeed many kinds of going on with some children fooling around with ink brushes and others punching each other or playing with dolls. Also from books behind the female teacher in "sue-no-maki" (end volume), we can see that flower arrangement, tea ceremony and incense burning were taught in addition to reading and writing. This being said, the teachers at terakoya teachers strictly instructed morals, manners, and rules of decorum and there was a fixed set of rules in the class with punishments for excessive misbehavior whereby children were made to stand still or sit erect with legs folded. At Terakoya, the education method greatly differed from the present and children generally learned how to read and write. Different textbooks were used for children of farmers and for children of merchants so that each could obtain the respective knowledge neccesary for farming or trading. The general name for the textbook used in terakoya was "ōraimono". The objective of these studies was to learn how to write a letter to someone, and the textbook was called "ōraimono", which means to learn texts that go back and forth. Teikin-ōrai was one of "Ōraibutsu" textbooks often used to learn basic culture and calligraphy at terakoya (temple school). When it was first developed in the Muromachi period, it was used to educate children of aristocrats, samurai, and monks but it was said to have been most popular in the Edo period as a textbook for common people. In addition, "Onotakamura Utajizukushi", which was developed in early Edo period to learn Kanji, was so popular that multiple editions were published throughout the Edo period. The textbook contained kanji characters with the same "radical" and "tsukuri" such as 椿, 榎, 楸, 柊, 桐, etc. and also contained was a song to learn and remember them by (haru tsubaki, natsu ha enoki ni aki hisagi, fuyu ha hiiragi onajiku hakiri). The terakoya, or "temple schools" that became common in the Edo period, were organized much like the private, after-school cramming classes found today. Rather than follow the same curriculum as others in their grade, however, the students progressed at their own pace. The subjects they were taught were primarily reading, writing, and calculation using the abacus. They copied what the instructor wrote down, and practiced writing the same phrase over and over until they were able to approximate the teacher's handwriting. Most of the texts they read were Chinese and Japanese classics, which were repeatedly read aloud until they were practically memorized. The terakoya were found throughout Edo (now Tokyo). According to one Edo-period source, some neighborhoods even had two schools, suggesting a high literacy rate of the townspeople. Enrollment in these schools was about 70% to 80%, much higher than the enrollment ratios found in Europe at the time. There was no fixed curriculum for each grade and subject, as is the case today. Each school operator adapted the subject matter to the aptitude and progress of each child. Instruction followed a general course order, however, with children first learning the syllabary and then common kanji (Sino-Japanese characters) before studying more complex kanji and phrases. Many different textbooks were used, depending on the children's family background. In addition to academic subjects, children were also given lessons in some art, such as traditional dance and music. In the Ukiyo-buro (The Communal Bath), a late Edo-period novel by Shikitei Sanba depicting the life of townspeople and their children, a girl who is about to enter the bath describes a typical day to a friend: "After I get up, I go to the terakoya to prepare for the calligraphy lesson. Then I have a shamisen (a banjo-like three-stringed instrument) lesson before I come home for breakfast. I go to the terakoya again after my dance lesson, and it's already 3 o'clock by this time. I go to the bath and then go to my koto (zither) lesson. I come home to practice the shamisen and dance parts I learned that day. I play for a while, and after the sun sets I practice the koto." 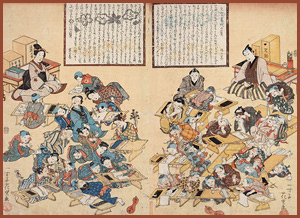 While not all children may have been this busy, many foreign visitors to Japan toward the end of the Edo period expressed surprised in their diaries and journals at the high number of children who were able to read and write.
. Nightingale, bush warbler (uguisu 鴬) .
. . . CLICK here for more ukiyo-e of Edo Terakoya ! "Before Meiji, there were no such public schools in Japan as there are now. But, in every province there was a sort of student society, composed of the sons of samurai. Unless a man was a samurai, his son could not enter such a society. It was under the control of the lord of the province, who appointed a director to rule the students. The principal study of the samurai was that of the Chinese language and literature. Most of the statesmen of the present government were once students in such samurai schools. Common citizens and country people had to send their sons and daughters to primary schools called terakoya, where all the teaching was usually done by one teacher. It consisted of little more than reading, writing, calculating, and some moral instruction. We could learn to write an ordinary letter, or a very easy essay. At eight years old, I was sent to a terakoya, as I was not the son of a samurai. At first, I did not want to go; and every morning my grandfather had to strike me with his stick to make me go. The discipline at the school was very severe. If a boy did not obey, he was beaten with a bamboo stick, while being held down to receive his punishment. After a year, many public schools were opened and I entered a public school. On Japanese education in the Edo period. 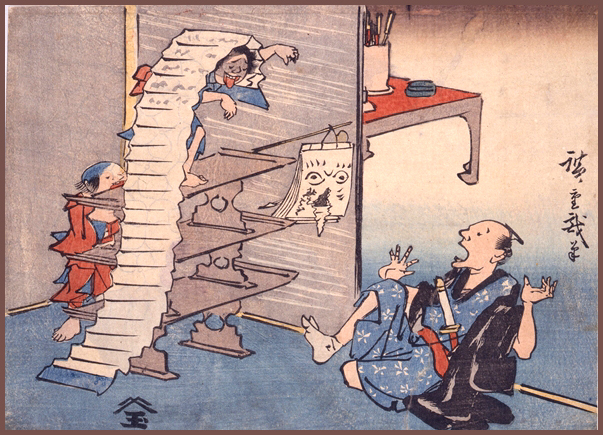 In the Edo period, the literacy rate of the common people was over 60% while that of the samurais was close to 100%. These compare to about 20% in London and about 10% in Paris. The terakoya temple school system in Japan led to effectiveness of Edo-period education. In 1874, it was one of the first temples with a 公立小学校 public elementary school in the compound, reflecting its long history as a terakoya 寺子屋　temple school. She opened a Terakoya temple school around 1860 and this became the center of education for the people of the Nagasaki district.